In January and February 2012 Spectrum received requests to change the agent’s desktop wallboard layout and content. These requests were easy to accommodate but it had created an interest in why were these requests coming in at that time. After a few phone calls and emails the replies were all the same: Agents are requesting changes to their desktop so they are able to improve and it is part of their New Year’s Resolution. This article is about the changes that were requested. Please note all company logos, agent names, and group names may have been changed or removed to protect confidentiality. 1. Make the Customer Happy: This request came from companies that were working with existing customers answering policy questions, account balances, product issues such as delivery/repairs/replacements. The requests did not come from companies that handled new customers/accounts, customer / account cancellations, or customer service / trouble ticketing skills. In this desktop wallboard the change request was to remove Calls Waiting and replace it with Oldest Calls Waiting. The agents that were getting this change were experienced and were well aware of any calls waiting. The agents wanted to know about the wait time so they could manage the calls they were handling at the time. In this example, the manager for this call center added in the Offered and Taken calls. To fit these in the Abandon Rate and AHT were removed. The size of the desktop wallboard was an issue so additional KPI’s just could not be added. 2. Improve themselves: This request came from many different call centers. It did not matter the size of the center or the business they were in. Agents were looking to improve themselves as part of their New Year’s Goals. Depending on the business and industry the call center is in the requests varied. 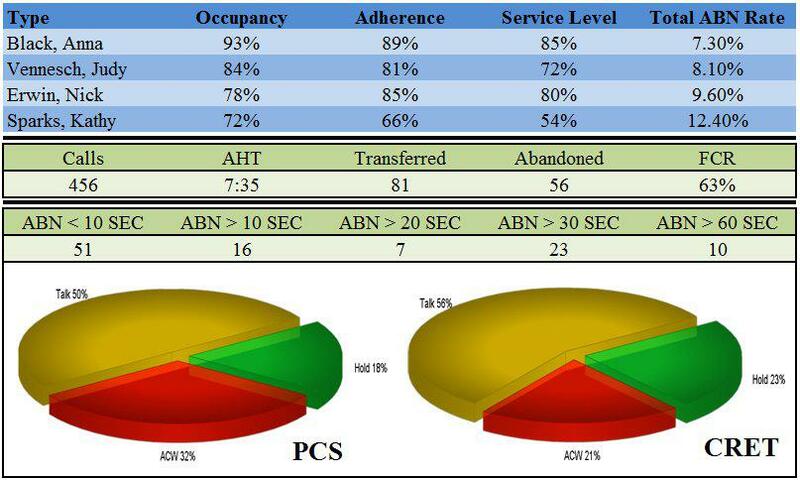 At one large call center the managers requests included: Average Handle Time (AHT), First Call Resolution (FCR), Occupancy % and Adherence %. Spectrum made changes for the agents and depending on the agent’s skills and experience they were given different KPI’s on their desktop. The manager’s dashboard is the example below. This managers dashboard also has multiple tabs that allow him to view group data, agent details, agent and group analytics and summary totals for all groups. A message will also run at the bottom of the dashboard but was removed due to the content. 3. Do well for the Company: This request was from aggressive companies that do a lot of on line business. In one case the company has a high agent turnover. They pay the agents well but if the agents do not perform they are terminated. For one call center the request was for AHT, Sales Revenue by Group, Sales Revenue by Agent, Lead Agent Sales and Lead Product Sales. This request was not put in place because Sales and Revenue figures were confidential and not approved by senior management. However AHT and ACD Calls for the day were added. At Spectrum we receive requests from customers to make changes to their agent desktops, call center digital signage, dashboards, web reports, etc. However, at the beginning of the year we receive an increased number of desktop changes that are started by agent requests to the manager. Some of the changes were so interesting I had to follow up with these requests to learn more about why they wanted to change/add the KPI’s on the desktops and dashboards. Changes made to LCD screens, Phones, Tablet PC’s and web based reports were all very standard. Agent turnover – Companies with Call Centers, Out Sourced Call Centers, Customer Service Centers and Help Desks were terminating agents based on poor performance. Some of the agents were looking to improve and not lose their jobs. Agents looking to improve so they are able to be promoted to another position or a different group: Seniority is not enough to be promoted. Agents needed to show improvement to a level that the team leaders or managers felt was enough to justify the promotion. Agents looking to improve enough so they can quit their jobs: If an agent improves they now have experience of success, get positive feedback from leaders and managers, receive awards and upper management praise, exceed goals. The agents would include these awards/feedback/praise to their resume. Managers mentioned the New Year starts the process of agents turning in their notice and receiving a higher than usual response to openings. Agents looking for a pay raise: Performance reviews are done at different times during the year. However, it appears that many agents look for a pay raise starting after the New Year. By improving their performance, meeting or exceeding goals and receiving praise from senior management agents use this as part of their request for pay raises. Change requests to the agents desktop and manager’s dashboard come to Spectrum often. Adding KPI’s, changing formulas, showing total’s, adding agent details and adding analytics are requested most often. The New Year’s resolution changes may be permanent or short term depending on whether the change request was positive or negative, if the agent moved on or was terminated and if the manager was satisfied with the agents performance change.